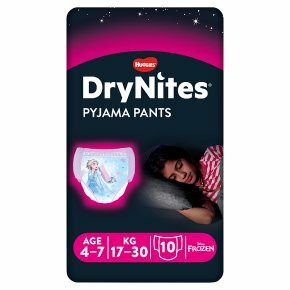 DryNites® Pyjama Pants are specifically designed to look and feel just like real underwear to help manage the bedwetting phase. Whether at home or nights away, DryNites Pyjama Pants take the stress out of accidents to allow kids to just be kids. DryNites Pyjama Pants feature age appropriate graphics and feature gender specific absorbency where it's needed. They have stretchy sides, a softer feel for a comfortable fit, and are made with discreet material to limit noise underneath pyjamas.